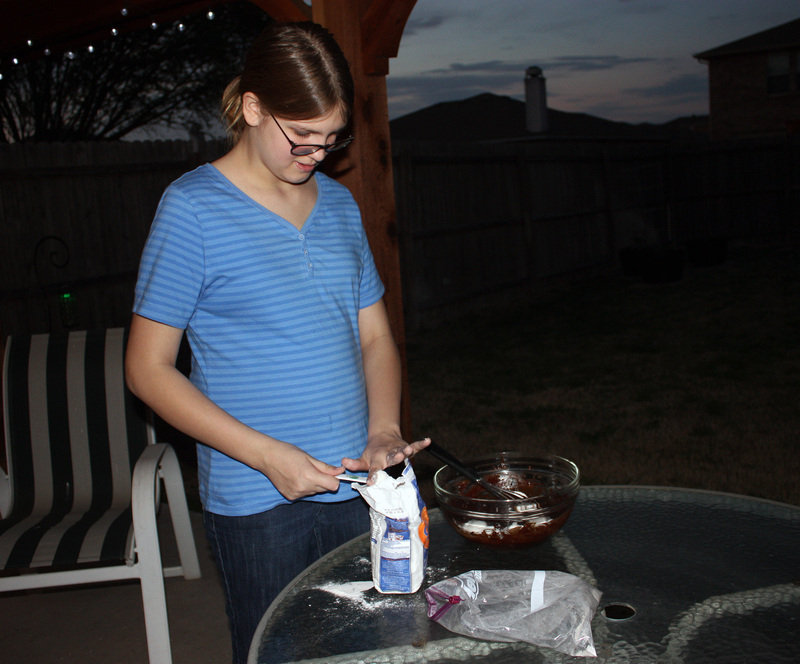 This weekend, Brittany wanted to make molten chocolate lava cake. She’d had a version of it at a restaurant for her birthday, and wanted to recreate it at home. 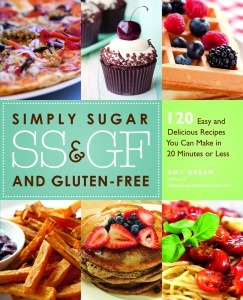 I researched and found several gluten-free recipes and was confident we could make a tasty version. But during this past week, she stated that she wanted to make it “with gluten”. I explained to her that it’s very likely it would taste just as good gluten-free, and that since I had zero molten chocolate lava cake experience, gluten-free or not, that gluten would not necessarily guarantee good results any more than gluten-free. But it was her decision. She insisted this was what she wanted to do. I agreed. (After all, the reason for the kids in the kitchen is to teach them cooking skills. Since they are not gluten or dairy-free, it is their decision whether they want to make their recipe gluten-free and dairy-free or not.) I started to make plans. Some background: our kitchen is not 100% gluten-free. I know there are varying opinions on this out there in the gluten-free community. However, I do imagine that there are as many people out there with celiac disease that have to share kitchens with gluten-eaters as there are people with entirely gluten-free kitchens, maybe even more. Regardless, those of us with sensitivities to gluten must take steps to ensure they remain healthy if there is a decision to keep gluten-containing ingredients in the home. For those new to a gluten-free diet, the idea of cross-contamination is often overwhelming at first. Cross-contamination is a term usually reserved for things like keeping raw meat separate from other foods and the like, not gluten. But even residual amounts of gluten can wreak havoc on the health of someone sensitive to it. So in an effort to remain healthy, steps must be taken to reduce or eliminate the risk of cross-contamination of gluten in food. One solution is to make the kitchen entirely gluten-free. If there are gluten-eaters, they can get their gluten “fix” outside the home in restaurants and such. On one hand, this is a simple solution from a cross-contamination perspective. But many times, not everyone in the family agrees this is the most feasible. We opt to keep some “gluten-y” foods around the home, mostly in the form of packaged bread, the occasional cracker, and beer. It’s all kept on one shelf in the pantry (with nothing underneath, in case somehow crumbs were to fall into other food). There are separate condiments in the fridge for gluten foods (such as mayonnaise, peanut butter, etc.) and the gluten-free versions are clearly marked on the lids. (Why have separate condiment jars? Well, if you’re like most people, when spreading something such as mayonnaise on a slice of bread, you will dip the knife in the mayo, spread it on the bread, and stick the knife back in the mayo again to repeat. Once that knife touched the bread, it’s VERY likely crumbs were clinging to it, and you then put crumbs into the mayonnaise jar. Crumbs = gluten = bad! Hence, the separate jars.) While I have heard that some people have opted to dedicate a counter space for the gluten foods to be prepared, our kitchen is too small for me to give up any space. Instead, the counters are thoroughly cleaned, and gluten-free items are never laid directly on the counter unless I have cleaned the counter immediately beforehand. If something with gluten needs to be cooked (occasionally, someone makes a grilled cheese sandwich or a frozen pizza in our home), there is a drawer below the oven that contains the “gluten-only” cooking utensils, such as a frying pan, spatula, pizza cutter, etc. There is a separate sponge used exclusively for cleaning the “gluten” dishes so no residual gluten is transferred from one plate to another. 99% of the time, this works for us. Other than my husband’s beer, gluten isn’t even consumed more than about once a week in our home, so while this sounds like a lot, it’s rather routine for us and not something we have to deal with every day. But when Brittany brought up the molten chocolate lava cake, I knew this was time for that additional 1%. While I knew I needed to take extra steps to ensure that there wasn’t flour everywhere in my kitchen (Flour can stay airborne for many hours, and could settle on just about any surface. Not to mention, I didn’t want to breathe flour for any length of time. ), I will admit, I was stressing a bit on how to best accomplish this. I needed to get a game plan together, because I didn’t want to be overly stressed during the time we were baking – this was about teaching Brittany to cook (and enjoying each other’s company! ), not “freak out” time for yours truly. So I reached out to some of my best gluten-free friends, and they gave me a wonderful idea. So great, I wondered why I hadn’t thought of it myself. Duh. It seemed so obvious. There wouldn’t be any flour in the air in the kitchen, no flour on the counters, no obsessive-compulsive cleaning (although I did do a top-to-bottom cleaning of the kitchen the following day, but that was just because it needed it!). Best of all, no worrying. I could be calm and relaxed and enjoy our time together. And so we did. After dinner last night, we gathered all of our “gluten-only” cooking utensils (measuring cups, spoons, wooden spoon, whisk, etc) and began. We started in the kitchen, melting butter and chocolate in the bowl, and stirring in powdered sugar and eggs. When it came time for the flour, though, we headed outside. (Forgive the less-than-ideal photos – it was 8 PM when we were working on this treat last night!) Only once we had the flour fully incorporated into the batter did we come back inside, where Brittany immediately washed her hands well to get the flour off. The ramekins were set on a piece of foil inside the “gluten-only” baking sheet, so that in the chance there were drips of batter, the batter wouldn’t be all over on the counters or in the oven. The dishes were all washed with the “gluten-only” sponge, and the table outside washed down and cleaned. 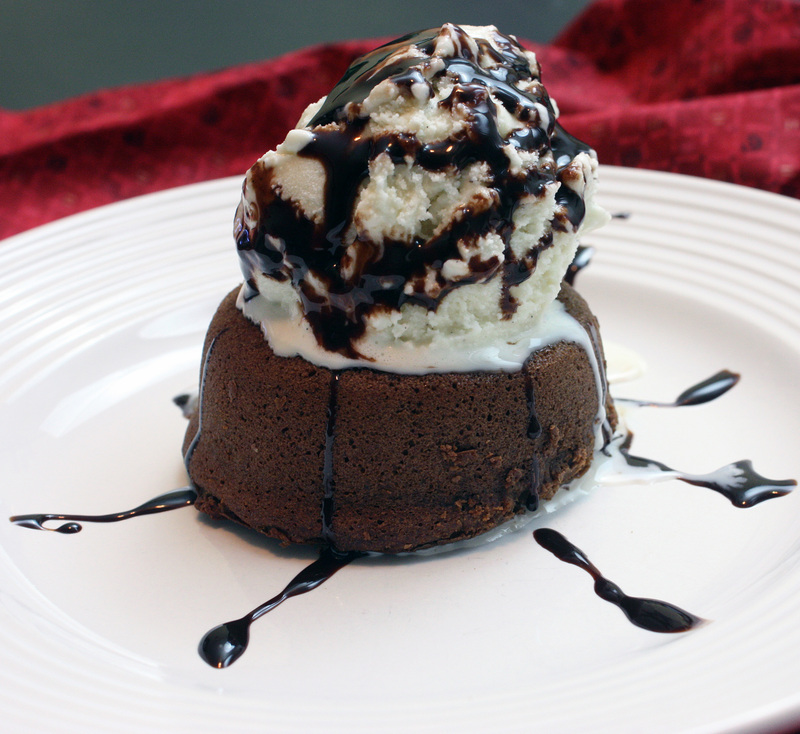 And as for the molten chocolate lava cakes? 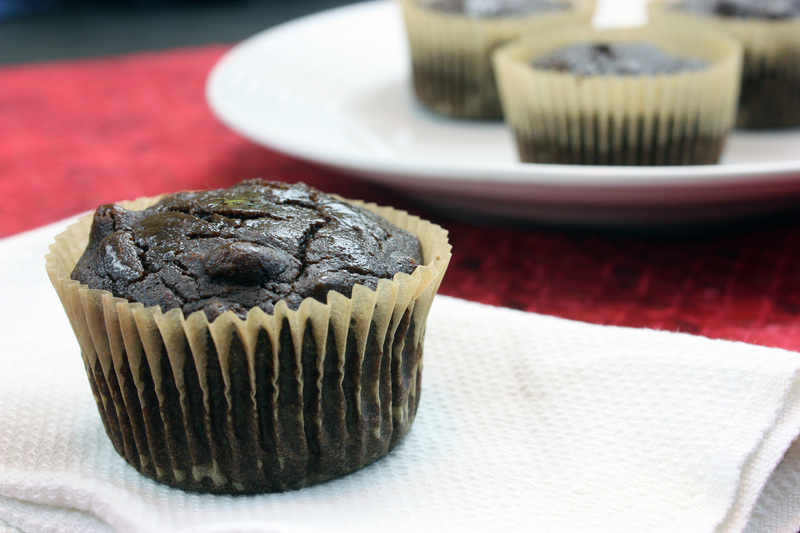 They were enjoyed by the gluten-eaters in the home – they were described as tasting brownie-like on the edges, and while different than the ones at the restaurant, they were delicious. forgot to take a shot of the molten lava inside, but trust me, it was there! One day soon, I’ll attempt a gluten-free version. (I do have this part of me that wants to prove that a gluten-free, dairy-free, even refined sugar-free version can be just as delicious!) 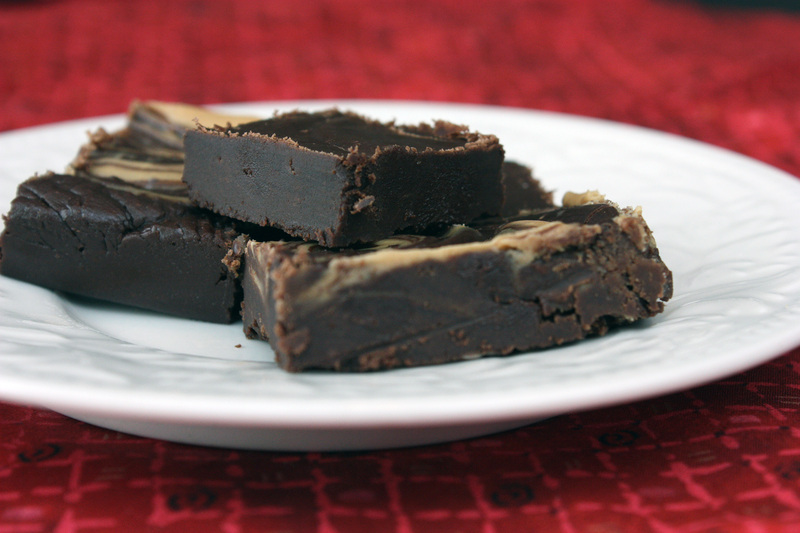 But until then, I’ll share that we used this recipe over at Tasty Kitchen. It’s a really easy recipe, so it was perfect for Brittany. What about you? If you have someone with food intolerances/allergies, do you eliminate that item entirely from the home? If not, what do you do to ensure cross-contamination issues don’t occur? Matt wanted to make cinnamon rolls. This was what was decided on the weekend before last. I hadn’t perfected my “healthier” cinnamon roll recipe yet, and while I’ve bookmarked quite a few, I thought that perhaps Matt didn’t want to experiment with those. Instead, I made plans to make these from I Am Gluten Free (who is now Gluten-Free Diva), as I had made them before, early on in my gluten-free life, and they tasted very much like the original – light, fluffy, and deliciously cinnamon-y. And then Matt changed his mind. Normally we don’t do last-minute changes, particularly when things like live crabs were purchased. 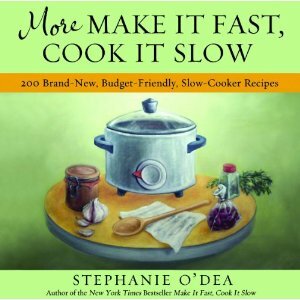 It’s just not that easy – someone still has to cook up perishible foods like that. But in this case, it was an easy switch. He wanted to make chocolate chip cookies instead. I thought, and realized I had all of the ingredients for some version of a chocolate chip cookie. But which recipe would I choose? I’m notorious for never making the same recipe more than once when it comes to baking – I love to experiment. I hadn’t yet perfected a relatively healthy, yet still chewy and delicious chocolate chip cookie. Elana’s recipe has been my favorite so far, but I was still on a quest. And while I love that cookie, it’s not exactly as familiar as a traditional gluten-y and sugary cookie. This time around, I wanted to allow Matt to make cookies like he was used to – the kind of cookies he loved. So I scoured the internet a bit. It didn’t take long, because my favorite trustworthy TV “chef” had a solution – a gluten-free chewy cookie. That’s right, Alton Brown went gluten-free! (Okay, just for this recipe. Admit it though, I had you going for just a split second, right?) I made minor changes, making it also dairy-free, and we were on our way to making chocolate chip cookies. To be straight, this is NOT a healthy cookie. Nope. Not at all. But was it chewy? Oh yes. Was it slightly soft in the center, with slightly crispy edges? Most definitely. Was it full of chocolatey goodness? Indeed. I had to hide them from myself until the kids took them home, once I had my cookie. They were addictively good. Definitely a treat – not something I could keep around the house. But they also delighted the kids – so they were indeed a success! Melt the vegan butter in a small saucepan over medium heat. Once melted, pour into the bowl of a stand mixer fitted with the paddle attachment. 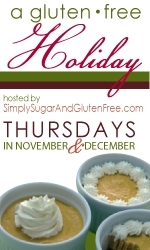 In a medium bowl, add the brown rice flour, the potato starch, the tapioca flour, guar gum, salt, and baking soda. Whisk together and set aside. Add to the melted butter the sugar and brown sugar. Cream together on medium speed for 1 minute. Add the egg, egg yolk, milk, and vanilla extract and beat until well combined. Reduce speed to low and add the flour mixture gradually until well combined. 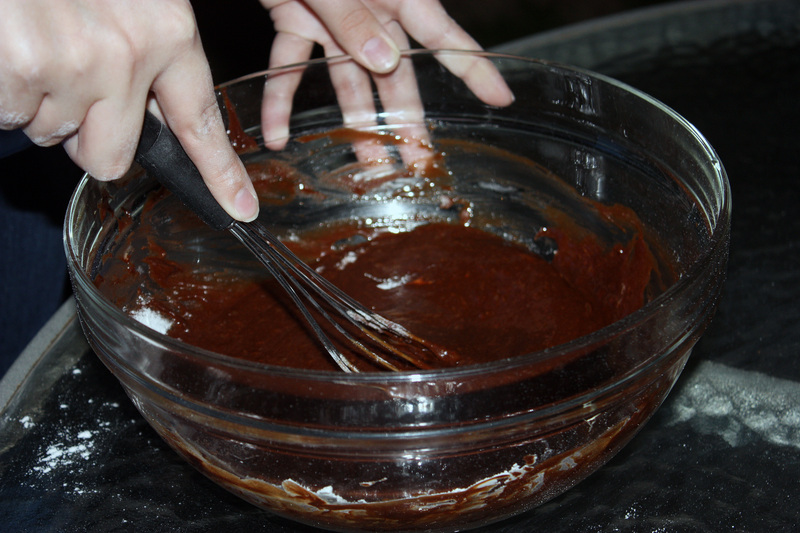 Add in chocolate chips and stir. Shape the dough into 2-ounce balls and place on parchment (or Silpat) lined baking sheets, no more than 6 to a sheet. Place oven racks on the upper and lower thirds of the oven, and place one baking sheet on each. Bake for 7 minutes, and then swap the baking sheets and bake for an additional 7 minutes. Remove from oven and allow to cool for a minute or two, then transfer to a wire rack to finish cooling. Makes about 2 dozen LARGE cookies. 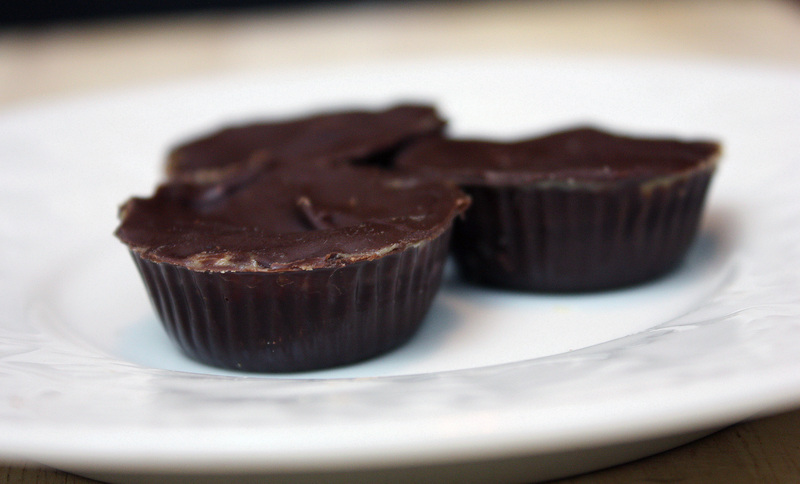 Peanut butter cups rank pretty high up there in terms of favorite candy, when it comes to our kids. I can’t blame them – I long for those creamy, sweet, delicious treats myself, but because of my dairy “issues”, most store-bought candies are off of the list. So when Matt said he wanted to make these, I was excited. Not only would we be rewarded with delicious candy treats, the process was relatively simple and fun! This would be a great project if you happen to be home with your kids during the holiday break. Candy molds are relatively inexpensive, and if you use the paint brushes, it’s almost like going back to kindergarten – and who doesn’t love that every once in a while? And when you’re getting to eat your project when you’re finished, then it’s the best kind of project available! 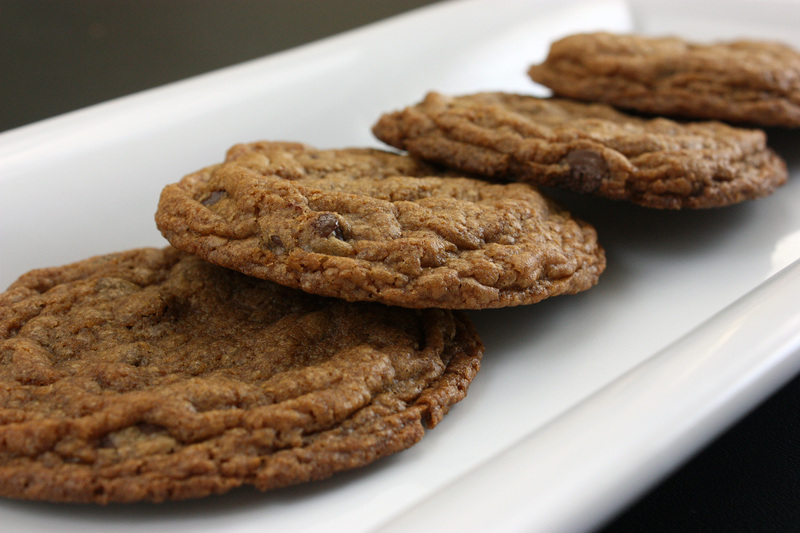 If you are looking to make this dairy-free, be sure you find dairy-free chocolate chips. I used Enjoy Life brand, but I’ve found some other brands also are dairy-free. And of course, if you or someone in your family can’t do peanut butter, then almond butter or even sunbutter would work! 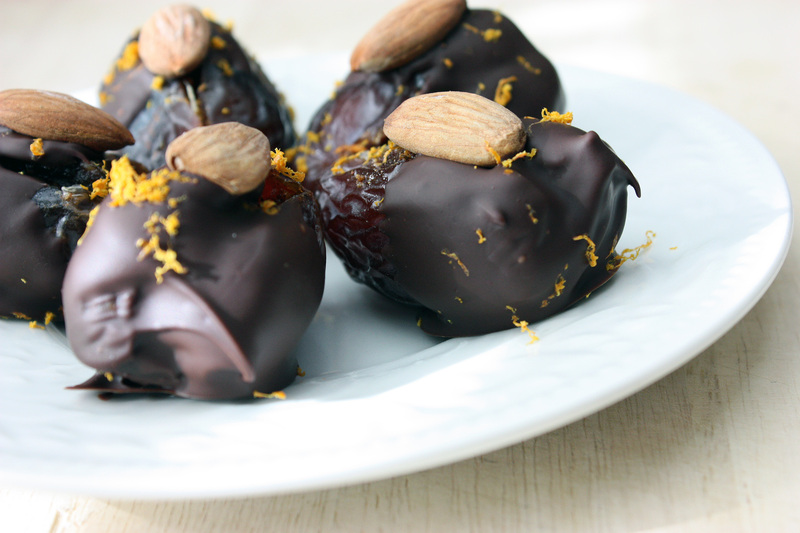 You can even try to use a bit of jam (I’ve used raspberry jam in the past) and make fancy bon-bons! In a double boiler (or you can use a small saucepan with a bit of water in the bottom, and place a stainless steel bowl on top), bring water to low boil and add chocolate chips in top. Stir slowly until melted. Turn heat down to low. Using a paint brush (I used a cheap one – no need to get fancy), paint chocolate in the inside of the mold, making sure to coat evenly and thoroughly. Place mold in freezer for a few minutes. Remove from freezer, and scoop small amounts of peanut butter into each mold. Freeze again for about 10 minutes. Remove from freezer, and paint chocolate over the top of the peanut butter, making sure you have enough to “seal” the filling inside the candy. Freeze again for 30 minutes, and remove from freezer. Turn mold over and pop the candies from the mold.